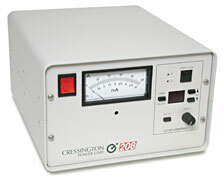 The 208C uses a unique fully integrated electronic feedback-controlled power design for the rod fed Bradley type carbon evaporation source. Current and voltage are monitored by sensor wires in the evaporation head where the evaporation source is part of the feedback loop. This feature gives the conventional rod fed carbon source unusual stability and reproducibility. The carbon source uses two-step ultra pure carbon rods. The evaporation source can be operated in manual "pulse" or manual "continuous" modes. The pulsed mode, when used in conjunction with the optional MTM-10 high resolution thickness monitor, gives absolute control over the desired thickness of the carbon coating. The automatic mode lets the user set the voltage and time, which together with the two-step rods gives consistent coating combined with ease of operation. The modular design of this practical-size chamber accepts a range of attachments, which can be readily implemented. The telescopic pillar gives a simple, rapid adjustment from long to short working distances to change the evaporation rate. For SEM, EDS/WDS and microprobe analysis applications, the Rotary-Planetary-Tilting stage with variable speed, adjustable tilt and 4 specimen holders ensures uniform coating on multiple samples. The Rotary-Tilting stage is specifically designed for TEM and analytical applications and holds either 25 x 75mm (1" x 3") glass slide, 7 standard 12.7mm pin stubs or 3 sample holders. Both stages are mounted on a mounting collar and can be readily implemented in the chamber. 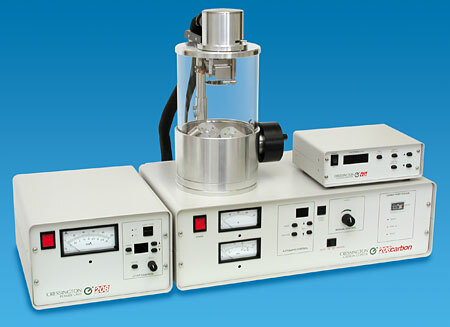 The modular design of the 208C permits easy addition of optional coating accessories often used in EM labs such as metal evaporation and aperture cleaning devices. The accessories are all driven from the sophisticated 208 Auxiliary Power Unit. The accessories are connected to the APU by means of a "smart" cable. The APU detects the device and enables the controls accordingly for ease of operation. The APU contains a digital timer and digital HT/LT controls for the accessories. The 208C and all accessories have integrated vacuum safety switches so that the unit can only be used under vacuum. 9620 208C High Vacuum Turbo Carbon Coater, 115V* each P.O.R. 9620-220 208C High Vacuum Turbo Carbon Coater, 220V* each P.O.R. 9624 208C High Vacuum Turbo Carbon Coater, Dry Pumping System, 115V, 50/60Hz each P.O.R. 9624-220 208C High Vacuum Turbo Carbon Coater, Dry Pumping System, 220V, 50/60Hz each P.O.R. 9640 Auxiliary Power Unit for Accessories, 115V each P.O.R. 9640-220 Auxiliary Power Unit for Accessories, 220V each P.O.R. 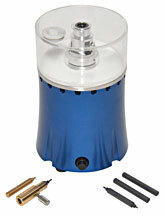 9650 includes: Mounting flange, vacuum safety switch, manual shutter and filaments. * The High Vacuum Turbo Coater includes: Microprocessor based, feedback controlled power supply with vacuum safety interlock; Automatic and manual evaporation control; Digital timer/voltage setting display; Analog vacuum and Amps display; Fully integrated all-metal vacuum pumping system with 67 l/sec. turbo pump on ISO 63 flange and a 3 or 2.5 cu. m/hr. 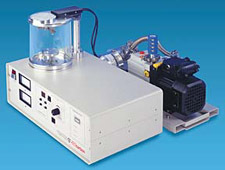 rotary pump, mounted on an anti-vibration table, stainless steel flexible vacuum hose and QF16 connection system; Glass chamber: 150mm dia. x 150mm H; Telescoping top plate support; Rapid source offset adjustment; Operation manual. Ted Pella, Inc has been an authorized distributor for the complete range of Cressington vacuum coating systems for over 15 years. Cressington Scientific Instruments Ltd, based in Watford, UK develops, designs and manufactures vacuum coating systems for scanning electron microscopy (SEM), transmission electron microscopy (TEM) specimen preparation and thin film research applications. Core competencies of Cressington are vacuum technology, DC magnetron sputtering technology, electron beam evaporation technology for EM, cryo technology for EM and thermal evaporation. 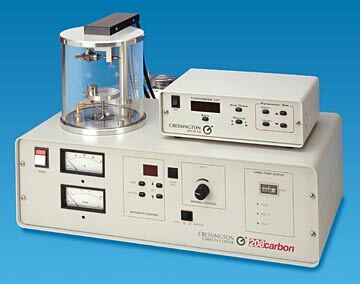 The Cressington products range comprises 108 series sputter coaters for standard SEM sample coating, the 108 series carbon coaters for standard EDX coating, the 208HR for field emission SEM (FESEM) sample coating, the 208C high vacuum turbo carbon coater for TEM/EBSD/microprobe carbon coating and the 328UHR and 328EB-Carbon for ultra high resolution sample coating. The 308R vacuum coating system for thin film applications is based on a compact versatile advanced pumping station which accommodates sputtering, thermal evaporation and electron beam evaporation all in a 12" light weight stainless steel chamber. Cressington takes pride in building products which have excellent quality, are compact bench-top systems and are easy to use.